What Next For Manchester United? It is doubtful that these comments were made with an economic view of the club as a priority yet that is the one aspect that has maintained and grown in his semi-absence. On the pitch, with one manager down and another lurching around and never far from the cliff’s edge, regular success appears to have been replaced by a lesser role; for the third successive season, the team can only be regarded as no more than top four contenders and silverware aspirations appear to have fallen to the level that an occasional cup win would be probably seen as a solid return. 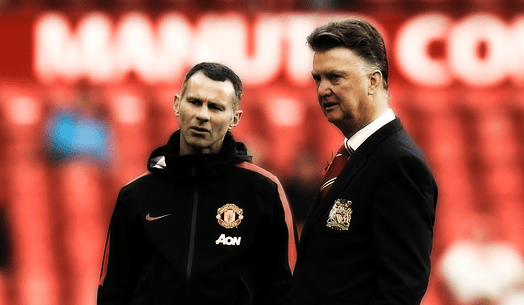 Within this new landscape, Louis van Gaal could be seen an ideal choice. Content to appear oblivious to consternation, he continues to work with a system of football alien to the Ferguson method and no doubt believes that he is extracting the maximum possible return from his charges. But sterile possession has become anathema to a fanbase brought up with goals, winning and trophies and aspects of his tenure remain far too similar to his previous time at a giant club, Bayern Munich, back at the turn of the decade. On March 7th 2011, as his second season drew to a close, Bayern announced they were to cancel his contract that summer, and by the 10th of April they brought that forward and sacked him. This is the time frame we now find him in at Manchester United and with him on record as saying this will be his final job, it remains to be seen whether his retirement in the Algarve is imminent, or whether that will have to wait for 2017 or beyond. To justify the huge volume of cash spent on new players, is it right to expect more? 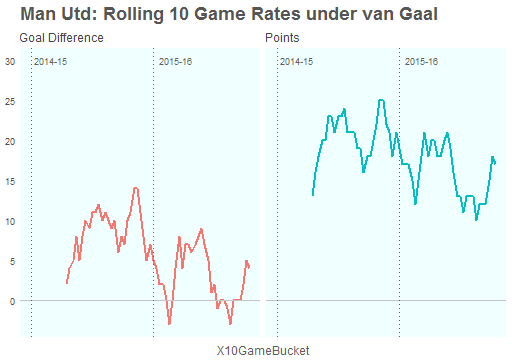 Has van Gaal been handicapped by a squad in perpetual flux or does the buck really stop with him, his signings, his system and the moderate returns he has created? Ferguson’s assertion on the quality and balance of his league winning squad in relation to the future looks like hubris viewed from this far out. Seven contributing players remain, only three under the age of thirty (David de Gea, Phil Jones and Chris Smalling) of which only de Gea has featured in more than half this season’s games. For differing reasons, Michael Carrick, Ashley Young and Antonio Valencia can feel fortunate to have maintained a squad position under subsequent management regimes and of the older brigade, only Wayne Rooney can be considered a guaranteed starter. From the outset, we can judge that van Gaal has had only three players from Ferguson’s regime to build around; de Gea, Smalling and Rooney, with Jones just far too frequently injured to be part of this equation. Add in Moyes signings Juan Mata and Marouane Fellaini, the only two purchases from a season in which there was an over-reliance on the qualities of the last title winning side, before we saw a change of policy upon the arrival of van Gaal. Ángel Di María came and went, Luke Shaw showed a willingness from the club to pay ludicrous fees to gamble on teenagers, Ander Herrera was Spanish and a midfielder so had credentials, Marcos Rojo had played in the World Cup and didn’t play for a top club so was available, Daley Blind fitted the “dad’s mates with the coach” remit and Radamel Falcao was once a forward. A pretty motley crew by any estimation and one brought together without what looked like a coherent plan. Fourth place secured, United doubled down last summer with two huge “potential” signings in Memphis Depay and Anthony Martial, a utilitarian midfield of Bastian Schweinsteiger and Morgan Schneiderlin plus an Italian full-back in Matteo Darmian. Throw in Sergio Romero as back up keeper, Jesse Lingard and a variety of kids and that’s Manchester United’s squad. From this array of hastily assembled talent, van Gaal has been expected to formulate a solid base, at least, and hopefully fashion top four contenders. It is largely a new and expensive team, but this is where blame–if appropriate–is tricky to allocate, as arguably his primary role is to coach the squad and maximise the output from the tools he has been given, or indeed chosen. With Manchester United’s recruitment policy variously veering from smart to reactionary to downright bizarre just what is an acceptable level of performance? 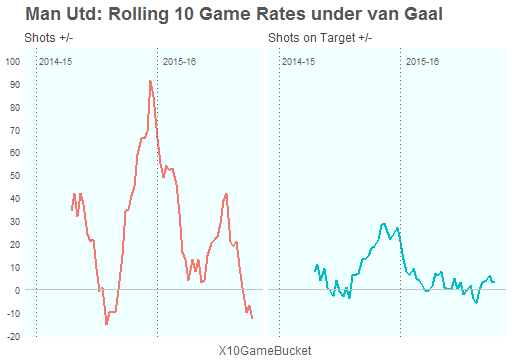 Simple stuff first: quickly we can see that as a rolling trend, during van Gaal’s reign, there has been something of a decline and his second season appears poorer than the first. Rolling goal difference and points quite naturally track in a fairly linear fashion and twice during this season, the goal difference has landed on a negative total. On each occasion this has signified runs of point-gaining at close to one per game. These outputs cannot be described as anything but sub-par. Even allowing for inevitable cold runs of form, a side aiming at the top four cannot carry these rates for long and expect to hit their targets. Manchester United no longer crush teams. It’s revealing towards van Gaal’s methodological desires that the shots peak towards the back end of last season came at the end of a three game losing streak in which United failed to score. In what feels like the absolute embodiment of the van Gaal era, his team beat Tottenham, Aston Villa, Liverpool then crushed Manchester City 4-2 before losing to Chelsea, Everton and West Brom. Forever in sight of the cusp of something, yet never quite reaching it. To this season and significant peaks of shots are a distant recollection. Most importantly, at no point have United been a dominant shots on target team, with these totals oscillating around zero almost throughout. We saw that the outputs (goals and points) were suppressed, now we see that the inputs (shots) are no better. It is hard to argue that this team deserves any more than it is currently getting. But what are the components here? Manchester United are a genuine top four team. Don’t get excited, to be precise, Manchester United are a genuine top four team on the defensive end. They have conceded the second least number of goals in the league from the third least shots faced and the fourth least shots on target. Take it to expected goals if you like that flavour of analysis and the story is the same. Daley Blind might not be a natural centre back but it matters not in this iteration of the team. Overall, they maintain more possession than any team in the league, complete their passes and disrupt their opponents passing at the third highest rate too. All these simple aspects of their play feed into what a good team should do. Manchester United’s attack is significantly below the quality you would associate with a top four challenging side. Leicester’s attack comes out historically on the lower end of such measures yet they at least have some attacking volume, coming out 8th and 5th for shots and shots on target, Manchester United rank 14th and 12th and are actually skewing positively for goals scored in 9th. van Gaal has fashioned half a good team and none of it is on the attacking end. This season they have spent 1301 minutes drawing 0-0, a total only exceeded by Crystal Palace and as far as action goes, their games feature the fewest combined volume of shots and shots on target and only Watford”s feature fewer goals. This overall shot repression of course impacts down to individual level, no player is exceeding rates of 4.5 shots taken and assisted per game or 0.5 goals scored and assisted per game, last season only Di Maria was able to escape the straitjacket. The trouble with comparing post-Ferguson Manchester United teams with the modern equivalent is the tangible difference in general quality. Even later year Ferguson teams were littered with superior talents in most positions, the lineage from Cristiano Ronaldo to Dimitar Berbatov and Robin Van Persie all supported by Wayne Rooney was a consistently high class forward line and though problems in midfield were exemplified by the recall of Paul Scholes from retirement, the defence was usually solid, with particular high quality mainstays Nemanja Vidic, Patrice Evra and Rio Ferdinand. So how many top class talents does van Gaal have at his disposal? Maybe three? David de Gea, Wayne Rooney and Bastian Schweinsteiger. There are those that rate Morgan Schneiderlin in the realm of defensive midfielders and Marouane Fellaini could be described as the best at what he does, if only it was possible to define what that is, but of the main three, only de Gea is in the prime of his career. Rooney and Schweinsteiger almost certainly have their best years behind them. This leaves van Gaal attempting to build a competitive unit from the base of one bone fide prime world class player; his goalkeeper, who lest we forget wanted to leave last summer. With a squad rapidly built over two summers and with a somewhat incoherent philosophy, 2015-16 stood little chance of being the season that Manchester United refound their stride. Both Depay and Martial are signings with enormous potential and in time may grow into stars, but for now it is too soon and the one irrefutably world class talent to have graced Old Trafford recently, Angel Di Maria, left in the summer. I’ve tracked injury stuff for 4 seasons now & I’ve never seen a team have 14 players unavailable to play like Manchester United had tonight. Hence the emergence, seemingly not by choice, of Marcus Rashford. This injury run has had a tangible effect on performance too, van Gaal’s teams have completed all passes at a rate of around 83% throughout most of his tenure, since the turn of the year this has dropped to 77% and overall possession has dropped from nearly 60% to around 52% during the same period, all clear low rates. They do not indicate quality in themselves, but reflect a change against longer term trends and as we have seen throughout, control of the ball is a key tenet to van Gaal’s prescriptive methodology. If we refer back to the earlier chart, the shot rates have declined during this same period. It’s hard to attain a high level of performance during an injury blight. Pre-season, a reasonable target for this team was to maintain their level. Any expectation that they would suddenly morph in to title contenders required an extremely positive reading of their performances in 2014-15 and a hope that all of their new signings would gel and succeed. Leicester City’s fairy tale rise will cause many a fan base to believe that similar runs are possible for their team in the future, and moreso for already wealthy and strong clubs, but it is quite evidently a one off influenced by a series of factors that have benefited them and harmed others. A smarter comparison might be the rise of Tottenham who have built a squad and coherent unit through ruthless pruning and a patient integration. This is not something easily replicated with a series of high priced signings and that van Gaal’s force of will has managed to imprint such a distinct style onto his charges is to greater credit than is being given. Of course, the wider perspective demands “is this enough?” A club used to success via high octane football has found it hard to adapt to its changing environment and patience has worn extremely thin through an erratic season. That any version of Manchester United should be so shot-shy is an extremely tough sell and it is a genuine puzzle as to whether they would be in a better situation under an alternative manager. Louis van Gaal has become noticeably more pragmatic with age yet he has been unable to marry this with consistency in results. With a disconnect between spending levels, results and expectation, it is easy to forecast another attempt to rebuild the squad in the summer and the club faces the likely problem of having finance and reputation as the chief bait rather than a promise of footballing freedom or trophies. Should the internal power battles resolve, fifth or worse will make van Gaal’s departure simple to justify and any subsequent recruitment will inform the direction the club wants to move. Jose Mourinho will feel like a grab for glory, Ryan Giggs an ill-conceived rabbit in the headlights of Pep Guardiola’s juggernaut and another viable candidate in Mauricio Pochettino seems smart and comfortable enough to resist overtures. Sticking with van Gaal would arguably be a brave choice but there are a subset of fans that can see beneath the surface failures and understand the strengths in his style. It may well be that he–or indeed any replacement– is perennially limited by the quality in the squad and longer term reflection will look on this period in Manchester United’s history as one of prolonged adjustment, both of expectation and team building. That they are far away from title contention is hard to refute, and the journey back to the summit could be a long one.